I've been mailing back and forth on Gmail this morning, discussing bids on a house that my girlfriend and I are looking at. 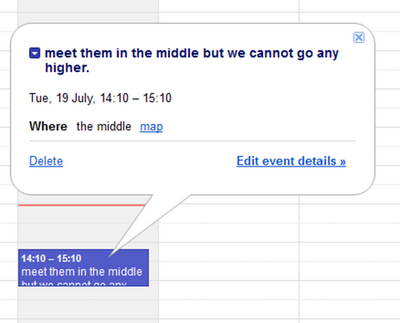 Google sent me a calendar invite for this afternoon, suggesting we up our bid and meet them "in the middle." My girlfriend didn't send me that. Google did. It's taken us a little while to work that out. It's very, very clever (and not a little spooky) but I think it might have got the wrong end of the stick on this one. "Or we say we'll meet them in the middle at 210, but we cannot go any higher. If they say no to that then we just leave it with them (and dare I say it, walk away if we need to.)" Google just passed the Turing Test. Even if it didn't realise it was joking.